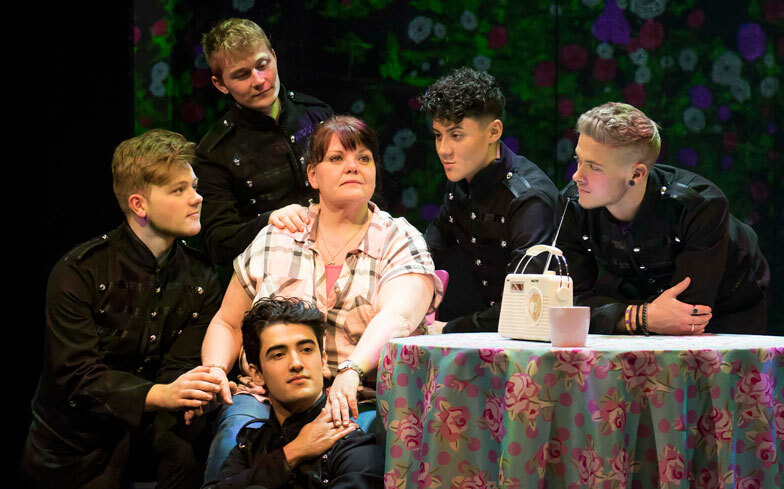 The Band is a new musical which tells the story of 5 teenage girls with a love for a boy band. The band are never named but they just happen to sing all of Take That’s back catalogue. These 5 girls however grow up and apart but when Rachel wins a competition to see The Band in Prague the friends meet up again and discover that whilst they have all changed their friendship is still there to give them support. Some readers may recall the BBC1 programme, ‘Let It Shine’ which set out to find the members of ‘The Band,’ who will ‘star’ in this musical. One of the judges was even Gary Barlow. The band are made up of AJ, Curtis, Yazdan, Nick and Sario. I was underwhelmed by their performances, especially vocally and felt that there could have been more attack. They all moved well and were together as a group but there was also a distinct lack of personality or character from the boys. Boy Bands are notorious for having a ‘cute one’ the ‘one that dances’ etc but in this case they all just seemed to blend as one. The girls on the other hand were bursting with personality and energy. They all had very clear characters and part of my favourite part of the plot was seeing how these character traits developed from the 16 year old girls to the adult women. Both age sets had a huge amount of energy and there were some great one liners delivered by them. Vocally I wasn’t bowled over by the performances. Although most of the music is performed by ‘The Band,’ when the friends were given a chance I would have liked a bigger sound. The story itself was fun with a good heart to it. I found that it worked best when it was delivering comedy and the parts of the show that were meant to be more emotional didn’t move me. 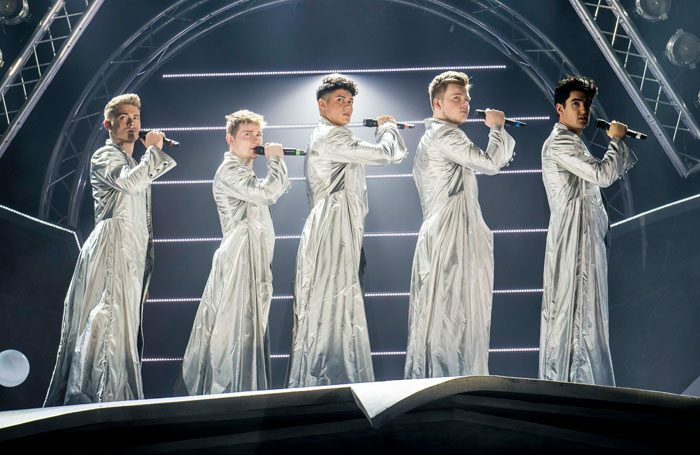 Hearing the music of Take That was also a great nostalgia fest, taking me back to me tween years although it did feel as if the music very much took a back seat to the story. Visually The Band is impressive with screens cleverly depicting a range of settings including an aeroplane and sandstone rocks. The design of the show by Jon Bausor was a clever one from unique AV to simple things such as members of The Band popping out of the girls lockers. The sound design however could have done with a little more attention as I would have liked to have heard more of the (real 5 piece) band and for the lead vocals to be turned up a notch. If you want to find out more about The Band and catch it on it’s final few stops on tour then it is playing at the Orchard Theatre until Saturday 9th February and is visiting Ipswich, Woking, Wolverhampton, Milton Keynes and Southampton as the final stops on the tour. If you liked this review you might also like my review of Six, Hamilton and Dirty Dancing.